Universal Tool Straight Adjustable Clutch Screwdrivers feature a 0.65HP motor for optimum torque, and double injection mold ergonomically advanced housing and grip. Universal Tool Straight Adjustable Clutch Screwdrivers also feature precision machined planetary gears with needle bearings, and a patented adjustable clutch that allows variable torque in forwards and reverse. Universal Tool Straight Adjustable Clutch Screwdrivers are best suited for high volume assembly where torque adjustment is required. The UT8955-1 Universal Tool Straight Adjustable Clutch Screwdriver is one of thousands of quality tooling products available from MRO Tools. Please browse Universal Tool Screwdrivers for tools similar to the UT8955-1 Universal Tool Straight Adjustable Clutch Screwdriver. 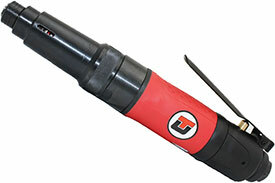 UT8955-1 Universal Tool Straight Adjustable Clutch Screwdriver description summary: Universal Tool Straight Adjustable Clutch Screwdriver. Motor (hp): 0.65 Motor (Kw): 0.48 Torque Range (in.lbs): 40-70 in.lbs Speed (RPM): 1,800 Exhaust: Rear Chuck: 1/4'' Hex Q.C. Weight: 1.50lbs/0.75kg Length: 9.50''/228mm Air Inlet (NPT): 1/4'' Quantity discounts may be available for the UT8955-1 Universal Tool Straight Adjustable Clutch Screwdriver. Please contact MRO Tools for details.